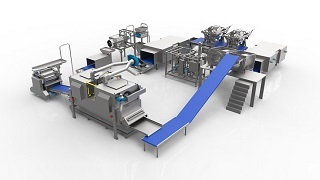 Drying equipment can be added to the line to enable the manufacture of high quality multigrain flakes. Pellet forming is used to achieve the correct size of flake. 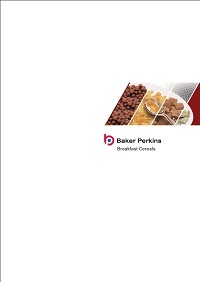 Controlled toasting and drying of the flakes takes place in the Baker Perkins Thermoglide2™ toaster. Multigrain flakes are made from a mixture of cooked grains (usually rice and wheat), flours and other powdered ingredients. Although the latter require no preparation or pre-conditioning on site, it is necessary to cook the grains. 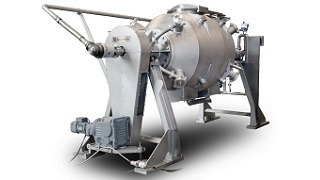 This takes place in Baker Perkins’ Rotary Cereal Cookers, which cook the grains in a pressurized steam atmosphere while keeping them moving by rotating the vessel. This is a batch process, so the cooked grains are held in a hopper that provides a continuous feed to a dryer. 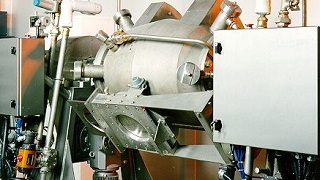 After drying and cooling, the cooked mass is screened for agglomerates and then conveyed to a holding hopper positioned above the feeder mounted above the pellet mill. Dry ingredients are mixed together, before being conveyed into a second feeder mounted above the pellet mill. The product is discharged through a plate die where it is cut into pellets, each one of which will eventually become an individual flake. 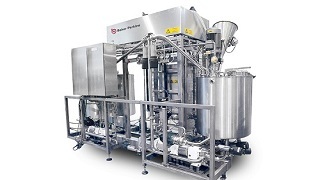 The pellets are conveyed by pneumatic line to a conditioner where they are held for a short time to allow their moisture content to equalize. 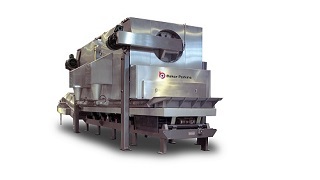 The pellets are fed into the Flake Master™ Flaking Roll Unit at a controlled rate, via a vibratory feeder. The rate is carefully controlled and matched to the roll speed to ensure that the pellets are well spaced as they are flaked to avoid forming doubles. 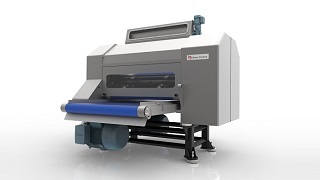 The thickness of the flakes is determined by the gap between the flaking rolls. Too thick and they will not have the characteristic crunch of a good flake: too thin and they are likely to burn during toasting. The gap is set and maintained by a high-speed monitoring and control system that uses hydraulic actuators to ensure that they rolls are neither forced apart by the pellets passing through nor move together if there is a gap. 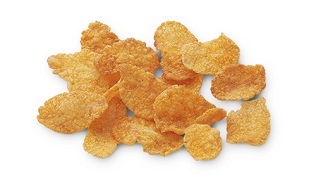 The flakes are toasted and dried in a Thermoglide2™ Toaster. A bed of flakes is built up on a vibratory conveyor that passes beneath a bank of nozzles through which air is blown at high speed. This fluidizes the bed of flakes and gently lifts and tumbles them to remove excess moisture, expand the individual rice grains and toast the surface to enhance the flavour and colour.